Dedicated to Chaos is the twelfth studio album by American progressive metal band Queensrÿche. The album was released first in Japan on June 21, 2011, and a week later in the United States on June 28, 2011, and is the band's first album for Roadrunner Records' Loud & Proud label. Like the 2009 release American Soldier, Dedicated to Chaos was recorded by Queensrÿche as a quartet; Parker Lundgren, who was a guest guitarist in this album, subsequently became a permanent member of the band. We are planning on a spring release. It will be a very strong collection of songs. The topic of the album is all over the place. There's a lot of different subjects we tackle. The sound and the writing direction is probably more focused on rhythm than any of our records have been. Scott and Eddie are contributing a lot to the composition of this record, so there's a lot of focus on rhythm structure and keeping things very rhythmatic and moving. It's got a lot of very intricate bass/drum work on it that perhaps hasn't been featured on earlier albums. Therefore it's going to have a very modern sound to it. Music these days, outside of hard rock and metal, is really rhythm-oriented. There's a lot of movement to it. So we're kind of going with that as a feature on this record. Still, there's a lot of interesting guitar work as we try to push the guitar into different areas as well, while trying to stay away from the bone-head stuff like the chunk-chunk-chunk kind of thing. We're using the guitars in a more melodic sense. The band is producing it with Kelly Gray, our longtime friend and engineer. We've got about three-quarters written and recorded. The album title was revealed as Dedicated to Chaos on March 29, 2011, with Tate calling the album "a clash and slash of musical experimentation anchored by the pulse of digital code”. A summer tour in support of the album was also announced. The album art was unveiled on April 13. The album's track listing was released on May 5. In June 2011, Michael Wilton revealed to Guitarworld magazine that "We had a couple of different ideas, and then the lead singer kind of changed the direction" of the album, and that his work was done "kind of through the mail". This was the last album by Queensrÿche before Tate was fired from the band in 2012, and the judge allowed for two different versions of the band to exist alongside one another until a settlement or verdict would determine which party had the rights to the name. A settlement was reached in April 2014, where Tate lost the name to Rockenfield, Wilton and Jackson. Part of the problem was that although Tate claimed that especially Rockenfield and Eddie Jackson have been contributing a lot to this record writing-wise", according to Rockenfield, Tate discarded their songs and those of Wilton in favor of songs he wrote with outside writers, such as Jason Slater and Kelly Gray, who produced the album together. About the sessions for Dedicated to Chaos, guitarist Parker Lundgren recalls that "[p]reviously, it almost felt like there was a battle between what songs to use, mainly the producers. It was almost like they wanted to cut the band out of it, even being a part of the process. That's how I felt. There were songs that ended up on the record that I never even heard. The record comes out and I'm like, 'I never heard that song when we were in the studio.' It was just bizarre." The album has received a mixed reaction, with some critics giving positive reviews, and others panning the album due to great stylistic differences to previous albums. Rustyn Rose of Metalholic considers the album to be "their best album in years" and advised the listener to "throw out [their] preconceptions of what Queensrÿche are "supposed" to sound like, and listen to it with ears wide open." Allmusic's Eduardo Rivadavia was more critical of the album, and wrote, "Queensrÿche are virtually unrecognizable nowadays, which is possibly worse than ripping themselves off." Sputnikmusic staff reviewer Trey Spencer criticized the album, writing "Dedicated to Chaos is [...] a whole new chapter in the band’s sound [...] that most long-time fans will probably wish was never written." Among the most critical of reviews comes from Murat Batmaz of Sea of Tranquility, who wrote, "I had no idea Queensryche could release such an abysmal album. This is the lowest of the low, the worst of the worst. It is obvious this band is Queensryche in name only." He expressed a belief that "no one can save this band anymore. Not even [Geoff] Tate himself." The album debuted at No. 70 on the Billboard 200. The band's previous album, American Soldier, peaked at No. 25 on the Billboard 200. ^ "QR Signs with Roadrunner / Loud & Proud". Queensrÿche official website. August 27, 2010. Retrieved April 26, 2011. ^ "Queensrÿche's Scott Rockenfield Talks New Album, New Label". Attention Deficit Delirium. August 25, 2010. Retrieved April 26, 2011. ^ "QUEENSRŸCHE's Geoff Tate Talks About New Album". Brave Words & Bloody Knuckles. October 30, 2010. Retrieved April 26, 2011. ^ ""Dedicated to Chaos" – This Summer!". Queensrÿche official website. March 29, 2011. Retrieved April 26, 2011. ^ "Dedicated to Chaos Album Cover". Queensrÿche official website. April 13, 2011. Retrieved April 26, 2011. ^ "Chaos Track Listing Revealed". Queensrÿche official website. May 5, 2011. Retrieved May 5, 2011. ^ "Interview: Michael Wilton of Queensrÿche". Guitarworld. June 8, 2011. Retrieved May 14, 2014. ^ "Geoff Tate Wins Court Ruling to Continue Using Queensrÿche Name". Loudwire. 2012-10-20. Retrieved 2012-11-29. ^ "Tate Looses QR name". blabbermouth. Retrieved 28 April 2014. ^ Queensrÿche (2011-06-14). "Interview with Geoff Tate - Part I". YouTube. Retrieved 2013-07-16. ^ "Scott Rockenfield (Queensryche) 2013 Interview on the Signals of Intuition". The Signals of Intuition. 99.1 CJAM-FM. 2013-05-25. Retrieved 2013-06-14. ^ Hickman, Jody (June 2013). "In Words: Queensrÿche". Ice Vajal. Retrieved 2013-07-06. ^ Simms, Kelley. "Queensryche - Dedicated To Chaos Review". About.com. Retrieved 10 May 2013. ^ a b Rivadavia, Eduardo. "Dedicated to Chaos - Queensrÿche". Allmusic. Retrieved 7 July 2011. ^ Roth, Kaj (2011). "Queensryche - Dedicated to chaos". Melodic.net. Archived from the original on 8 March 2012. Retrieved 10 May 2013. ^ a b Rose, Rustyn (18 June 2011). "CD Review: QUEENSRŸCHE ~ Dedicated To Chaos". Metalholic. ^ McIver, Joel. 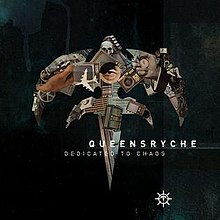 "Queensrÿche - Dedicated To Chaos". Record Collector: 100. Retrieved 10 May 2013. ^ Batmaz, Murat (July 21, 2011). "Review: Queensryche: Dedicated to Chaos". Sea of Tranquility. Retrieved 10 May 2013. ^ a b Spencer, Trey (June 23, 2011). "Review: Queensryche - Dedicated to Chaos". Sputnikmusic. Retrieved 5 July 2011. This page was last edited on 10 March 2019, at 19:52 (UTC).